Why content creation? Google’s latest algorithms have eliminated a do-or-or-die emphasis on keywords and instead focused on genuine human interaction through your site. Did people find what they were looking for here or were they duped into clicking because of some well-played keywords. Just getting clicks on your site is not enough. The google algorithms could be the focus of another entire series of blogs so in summation, google is looking for how well your site matched the needs of the person searching a topic. So how do you create an environment on your website that answers their needs? The answer lies within the content on your page and how helpful it is. The infographic mentions 3 areas to improve so let’s address them. First we will discuss how to target your keywords. The emphasis is no longer to focus on how to get google to rank your page based on keyword selection, the focus needs to be to match the keywords you select with the content your website presents. Don’t use keywords like “free vacations” or “million dollar homes for free” if your site doesn’t offer them. People will arrive expecting one thing and you will present a different option, this is what google wants to eliminate. Use keywords that address your area such as “rental homes Orlando” or “rental properties Nashville” if you have homes there. This will address 2 areas, first these keywords will match all of your listing and improve your visibility on google and secondly, they will match the rentals presented so people will get exactly what you described, again, making Google happy. Next let’s touch on the blog. A blog is a fantastic way to gain some leverage on Google as is keeps your site index constantly updated, allows for an even deeper sync of keywords to content, and its content is so organic and flexible that it can cater to more people than simple web content. Your site index is basically a back end view of your website. If your site has not been updated in 3 years with any new content, it appears out of date. Blogging creates new content every time you publish a blog, keeping the index updated and fresh for Google to review. When blogging, you need to use keywords for each blog like you did for each web page, this is to describe the blog and let Google know how to rank it. The same keyword mentality applies here as we previously described, however, since blogs are more organic, you can use a blog to tap into keywords and search terms that your website could not normally touch in a cohesive manner. For example, you have rental homes in Orlando and detail your keywords around family attractions and beautiful weather but then, a major league baseball team comes in for spring training. Writing a blog that describes the baseball team and their stay in the area gives you a chance to use keywords that may pull in some of their loyal fans while not deterring from your web keywords. Social media is the overall net that can wrap everything together. Think of it as your finishing tool, a perfect website with no social media presence seems a bit odd. As tends to be the case, a social media presence covers more than one base. When Google algorithm’s rank pages, it will scan your social media pages and the more social mediums you are on, as a coherent overall message, the more valid Google see’s your business and is likely to reward you. So using twitter to let people know about the weather at your homes, Facebook to share status updates and possibly run giveaways on, and Instagram/Pinterest to share photos of your beautiful homes can validate your web presence. On the second prong of its effectiveness, social media drives traffic. By linking to your site, anyone on these multitudes of platforms can be directed back to your website and, if your social media carries the same message as your website, the people coming through will be coming because they want to see is at your site. 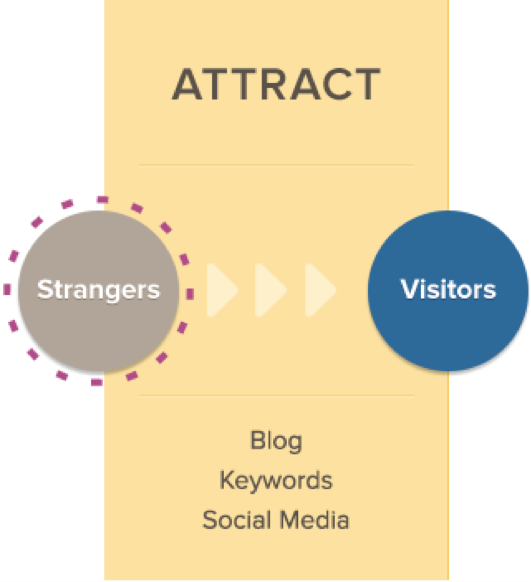 These basic overviews of the “Attract” stage of inbound marketing can help you increase the traffic to your site, giving you more views than ever before if implemented properly, turning strangers into website visitors. Next week, we will discuss how to take this influx of traffic and convert these visitors into leads. It is not enough to simply ramp up your traffic if you don’t plan to convert any more of them into your sales funnel. If you have any questions on the ideas presented please post a comment and I would be happy to help address anything further.